If you land at Sea-Tac International Airport, you’re in the heart of Seattle Southside’s hospitality community. This diverse area contains the majority of the hotels in Seattle Southside, as well the largest availability of rental cars in the state. Aside from a cozy place to lay your head, it’s also home to several parks, international cuisine and the Seattle Southside Visitor Center. What’s more welcoming than that? The SeaTac region is centered on the Highline ridge separating Puget Sound and the valley of the Duwamish and Green Rivers. 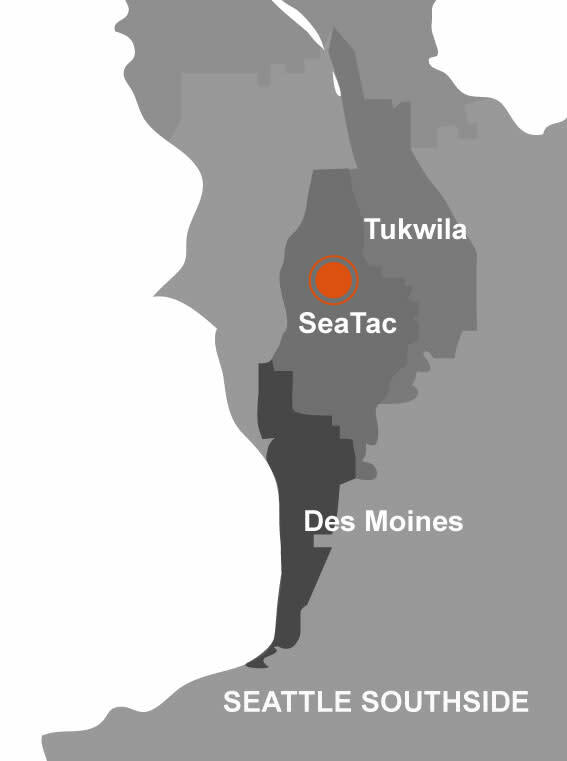 The Muckleshoot and Duwamish Indians who resided along those rivers were frequent travelers through the area for hundreds of years before the arrival of the first white settlers in the mid 1850s. As settlers arrived, the building of transportation corridors between their communities became important. The successive construction of Military Road, Des Moines Memorial Way and Highway 99 (now International Boulevard) fueled the area&apos;s gradual development up to the eve of World War II. Following the war, Sea-Tac Airport quickly became the region&apos;s primary aviation gateway and the area around it blossomed. Residents adjacent to the airport and in the nearby unincorporated areas voted to incorporate the City of SeaTac on February 28, 1990 and named it after the airport. The city limits embrace 10.5 square miles, including the airport and more than 25,000 residents, and swells with more than 80,000 workers and travelers on an average weekday. The city is home to approximately 950 business, about 70 of which are "Fortune 1000" companies. Companies such as Alaska Air and Horizon have their headquarters in SeaTac. SeaTac offers a number of quality residential neighborhoods and housing options to suit most every income. Residents share in the variety of cultural community events found in Southwest King County such as the International Festival in June and the Theatre in the Park summer concert series. The city maintains seven parks, two community centers, a skate park, off-leash dog park, Highline SeaTac Botanical Garden, and the Sieke Japanese Garden.